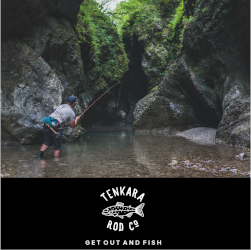 When I first started researching tenkara online, I noticed something peculiar. 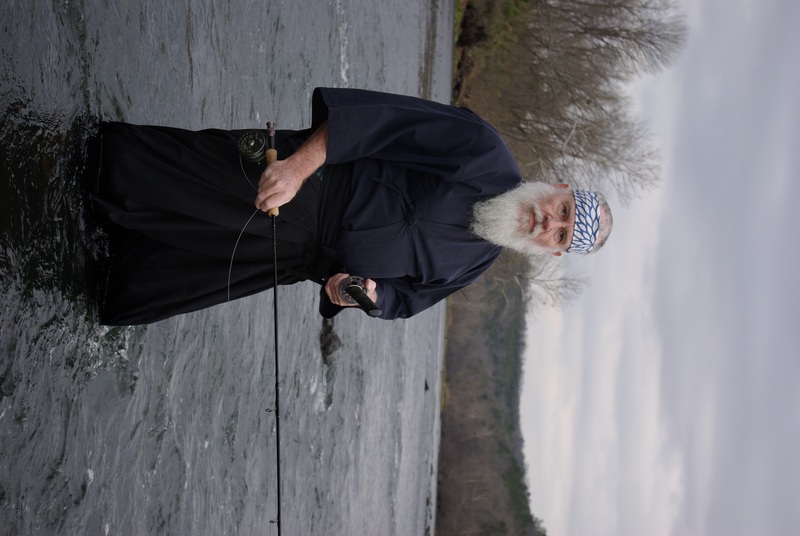 A substantial number of the Japanese anglers I saw in pictures and videos had towels wrapped around their neck. I was a little baffled at first. But having had a fair amount of exposure to Japan, and knowing that they’re a thoroughly pragmatic culture, I knew there had to be a good reason. The sarcastic part of my mind was content to leave my curiosity with the conclusion that they must have just gotten out of the shower right before hitting the stream. But honestly, I didn’t give it much serious thought. 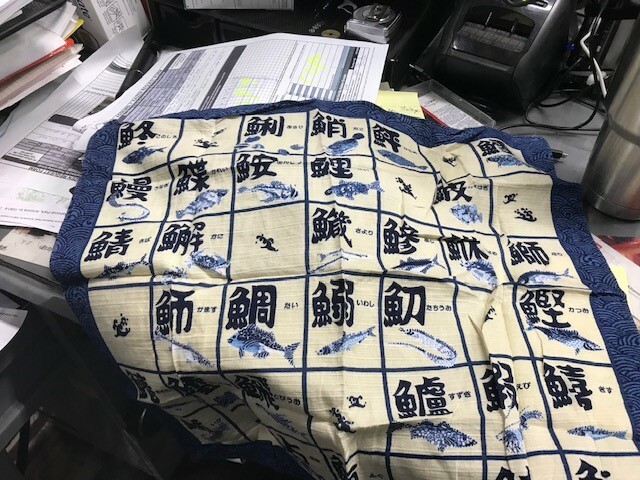 Years later, when I was the first person in the U.S. to import and sell Tenkara no Oni rods, one day, he included a mysterious blue towel in my inventory shipment. That’s when I remembered seeing the same kind in all those videos. But, I put it aside and forgot about it. Then, in the next shipment, another one came. And then another. And soon, I had a small pile of these towels and still had no idea what they were for! 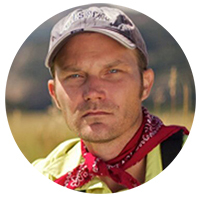 Sure, I understood that you could use them to clean up if you spilled coffee all over yourself at the trailhead. But I had gone three decades fishing without a towel and never felt the need to carry one. Still, why start now? 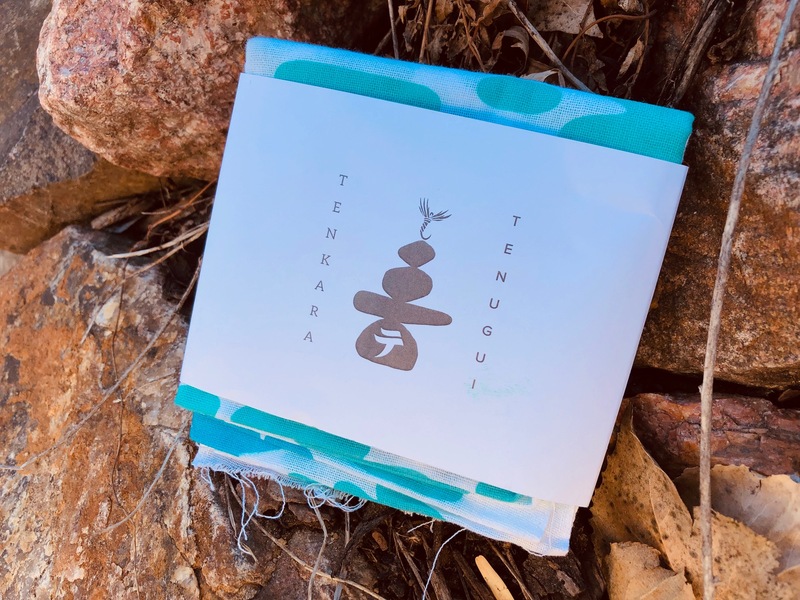 Then, at the 2019 Denver Fly Fishing Show, Daniel from Tenkara USA handed me a small folded towel which was labelled “tenugui“. It looked like a modern version of the ones Oni sent me–but with contemporary, stylized graphics rather than the more traditional looking patterns on my others. After reading the short description on the back, I finally got it. 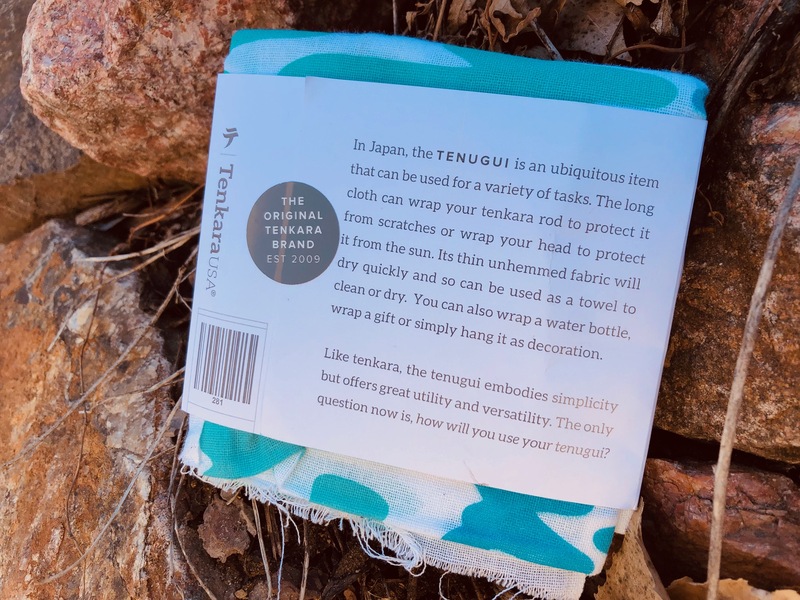 A tenugui is a long, thin towel (traditionally cotton) that is ubiquitous in Japan and is used for all manner of things (besides just soaking up your Starbucks latte from your new Simms waders). People use them in the kitchen, to wrap bottles, as decorations, souvenirs, and even as a head covering in certain martial arts. There are probably many other uses I’m not thinking of but you get the idea. It weighs next to nothing and takes up practically no space so with so many uses, it would almost be senseless not to carry one. 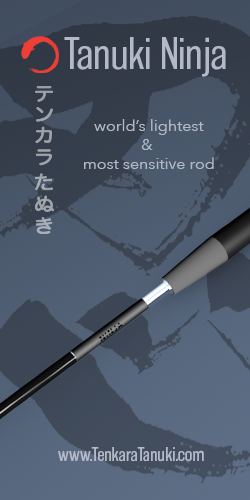 Pound for pound, it will probably be the most versatile thing you carry with you. My friend Dennis has one and uses it as a decoration on his wall. 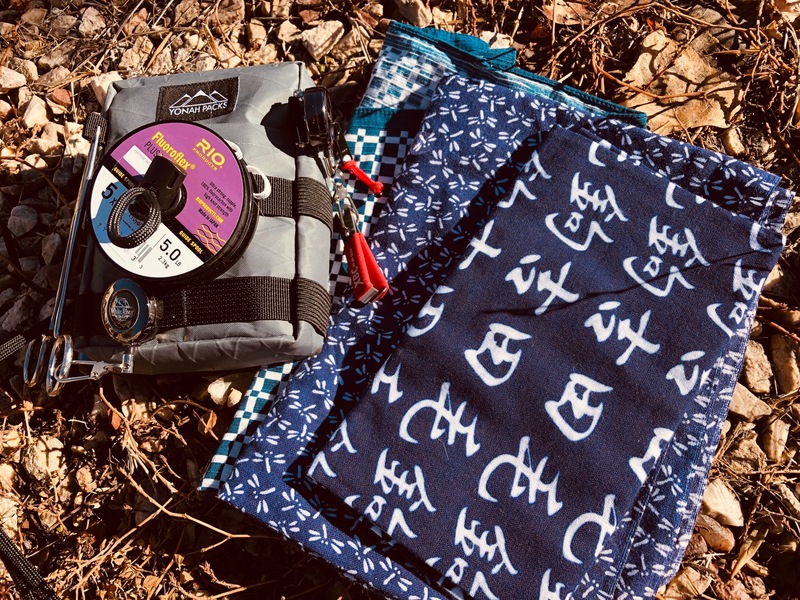 I’ll probably do the same with my tenugui from Oni because they were special gifts, but will keep the Tenkara USA one in my gear bag for sure. Now that I think about it, there were were many times when having such a towel would have come in handy and so now, I know I’ll use it. 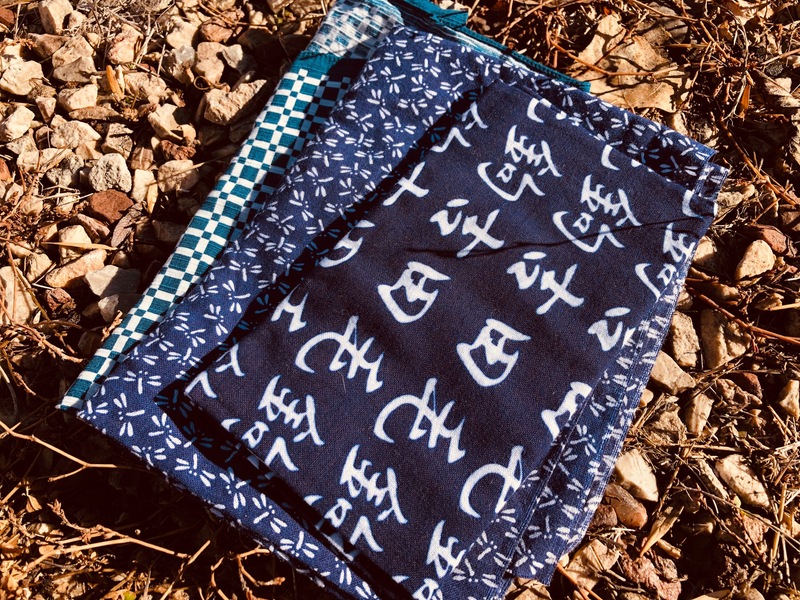 If you’re looking for a modern take on a traditional tenugui, they’re available at Tenkara USA. 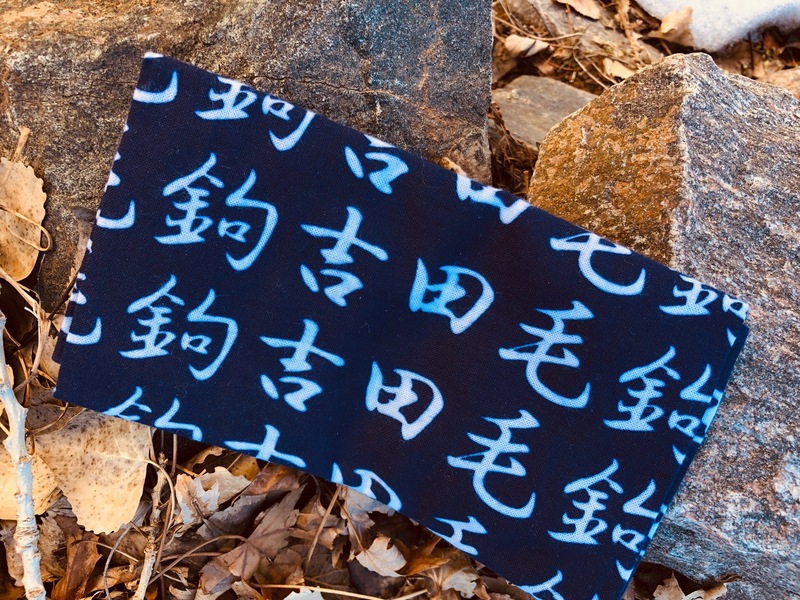 While contemporary tenugui are more frequently being made of terrycloth, this one is still made from the traditional cotton and measures 13″ x 36″ (33cm x 91.5cm). A “towel” certainly isn’t the sexiest piece of gear, but when you really need one, you’ll be glad you have one. 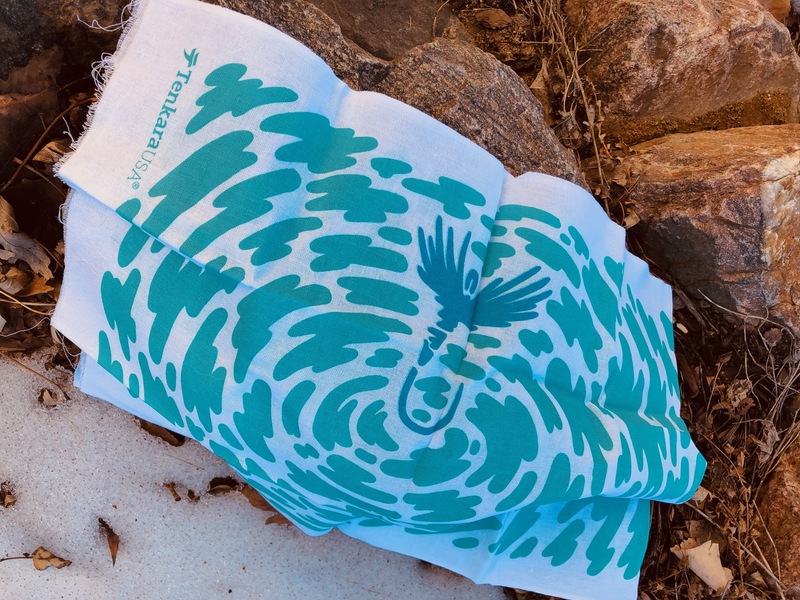 Do you carry a fishing towel? If so, please share a picture of yours in the comments below and tell us what you use it for. Interesting post! I don’t carry a “towel” per se, but I do have my shemagh, picked up during my Army career. 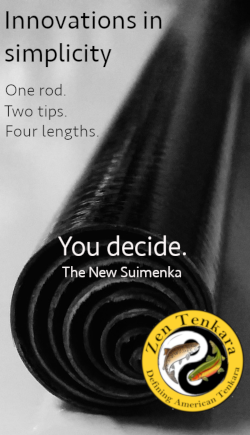 It serves many of the same purposes as your tenugui. Hi Jason. It gets real Hot here in California, so these are a popular item: https://www.bestproducts.com/fitness/equipment/g991/sports-cooling-towels/ I don’t know if they can perform all the tasks you have listed but, I can assure you from experience that wetting one of these down and placing it on the back of your neck will almost chill you on a 100+ degree day. 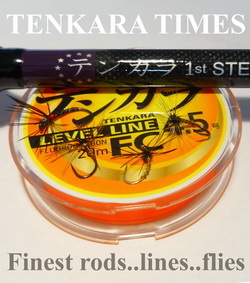 They are practically required for Martial Fly Fishing in Arkansas. 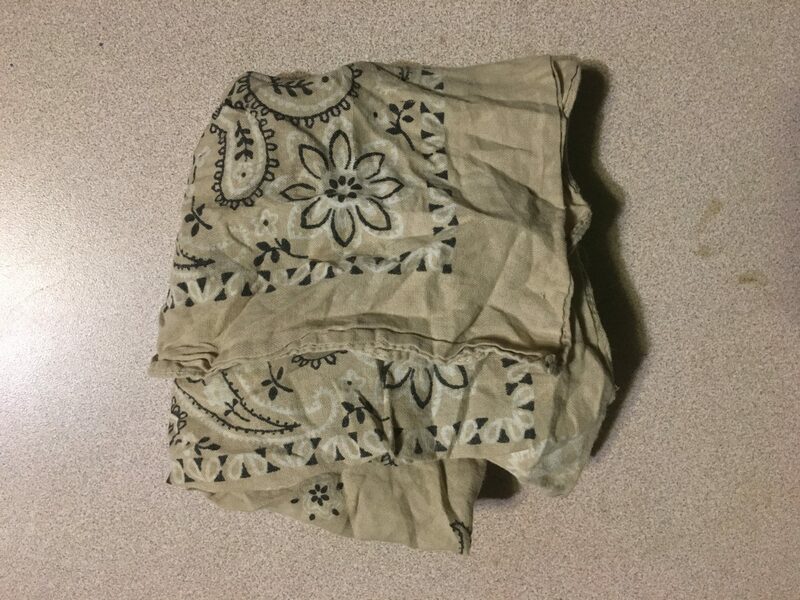 I’ve been using one as an edc for years…it’s called a bandanna! 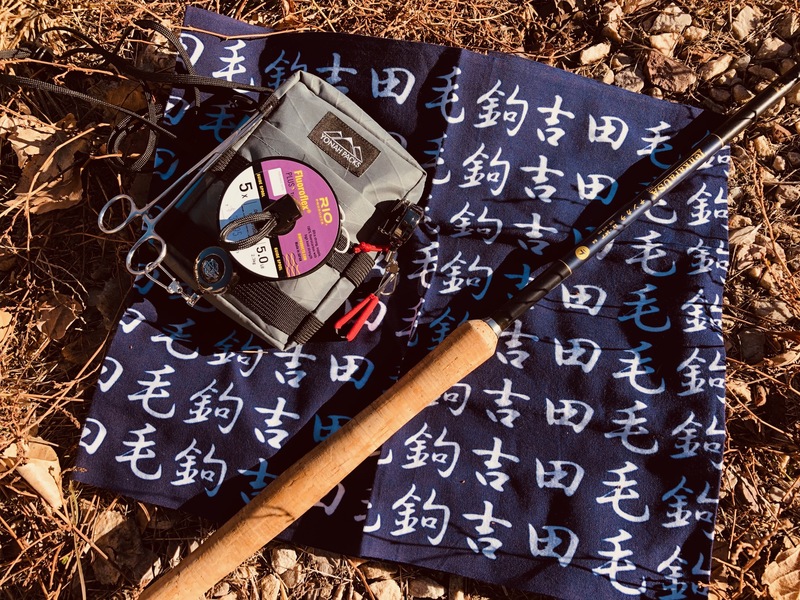 I carry an old cotton bandana in my left hip pocket – usually a blue one – not only when fishing, but everywhere, and for the same reasons. I buy them every trip to Japan. My father in law goes fishing everyday and got me my favorite. In the winter, I keep a small towel in my waders to dry off my hands after handling a trout. Dry hands = warm hands in Colorado! Same here Jason. 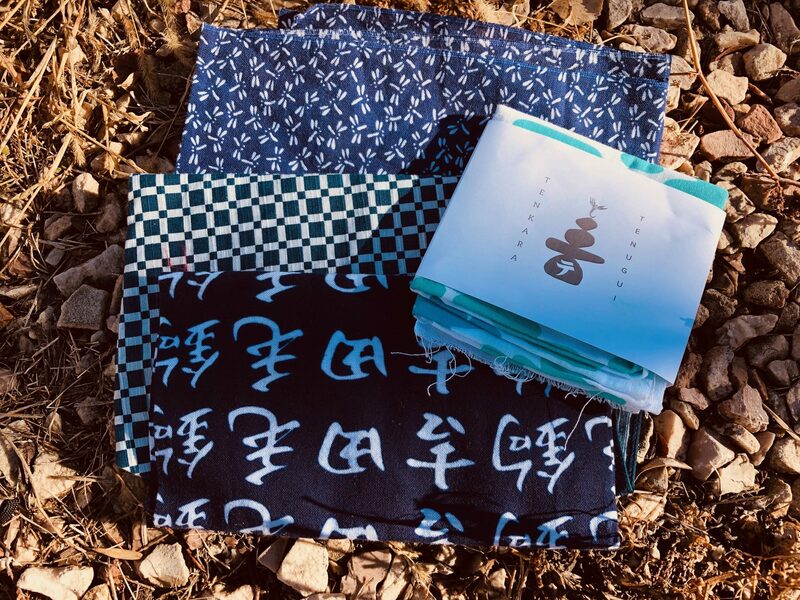 I received a couple of tenugui [ 手ぬぐい ] in packages from the Oni shop, and assumed they were a courtesy gift of fabric with a Japanese style print on them. Perhaps a bit of fabric left over from making a rod bag. 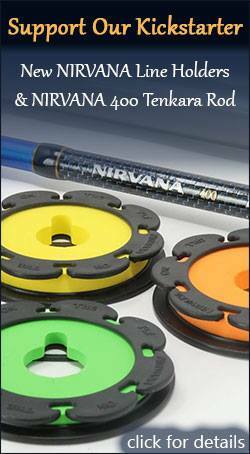 And did not know what they were until TUSA added them to their product line. fwiw – you’re supposed to pull off the loose threads from the un-hemmed end after washing them. The unraveling will afterward soon stop. There is a short video on YouTube showing how that is done. [ title, “How to clean up edge of Tenugui?”, on the WASABI J channel] The frayed ends are believed the help them dry faster, so don’t hem them to stop the fraying. I’ve also read that the matagi (bear hunters of old-time used to be) would sometimes cook their rice in them. The rice would be rinsed in the stream, then wrapped inside a tenugui, then buried in a hole in the ground covered by a stone, and small wood fire lit a top the stone. After a while the rice would be steam cooked.